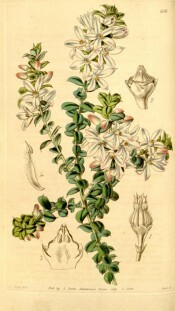 Frost tender, evergreen shrub with small, roundish leaves and solitary, pinkish, axillary flowers, to 2cm across, in early summer. To 60cm. [RHSD, FNSW, Beadle]. ‘This is a native of NSW, long since described by the late Sir James Smith, but we have never seen it alive till we had the pleasure of raising it from seeds, which were kindly communicated to us by H. M. Dyer, Esq in 1829. It is an exceedingly pretty plant, growing upright, with many short rigid branches, and producing its elegant flowers in April and May. […] Australia continues to be an inexhaustible source of beautiful plants, new forms and varieties being every day discovered, new monuments to the Wisdom of the Great Creator.’ [LBC no.1831/1834]. ‘An extremely handsome shrub, native of New Holland, bearing its large, showy flowers early in the spring, when so many other Australian plants are in perfection; it deserves a place in every greenhouse.’ [BM t.4101/1844]. ‘Its profusion of white flowers had a pretty appearance. There is a variety now in some of the nurseries having rose-coloured flowers.’ [FC p.100/1850]. Introduced to Britain in 1824. [JD]. Only listed in the 1857 catalogue [T.421/1857]. Possibly sourced locally as it occurs in the Sydney region.